By Temple Grandin Ph.D and Debra Moore Ph.D. The Loving Push is a very different type of autism book. It's aimed at the parents of teens and young adults with autism (or Asperger's syndrome) and it concentrates mainly on what comes after school. I've found very few books aimed at this audience and this one is undoubtedly the best. At 200 fairly densely packed pages, this is a moderate read which unlike other books of its kind does not frequently retread the same ground. The opening chapter talks about real people with autism and/or Asperger's syndrome who have transitioned to adulthood with varying measures of success. This is not a book of stories about geniuses and many of the young adults in the first chapter simply have "independence" as their main goal. It's a very sobering and realistic look at what comes next. It's in this chapter that the book really clarifies its title; "The Loving Push". It can't be emphasised enough that sometimes as a parent you need to back off and push your kids to do things for themselves. Chapter 3 covers breaking bad habits, like being unmotivated or reacting badly to problems and failures. This chapter also spends some time comparing the lifestyles of young adults with autism and neurotypical "normal" young adults. It's a great comparison which will have many parents nodding their heads as the realisations hit. Chapter 4 deals with stretching your young adults beyond their comfortable boundaries while chapter 5 deals with apathetic or anxious people. These chapters are full of great tips and real life examples, many of which are from the parents and kids in the opening chapter. It's Chapter 6 that really is the eye-opener in this book. As a person with a long history of computer gaming, I've always had issues with Temple's crusade against gaming. I'm pretty sure that I was tensed up ready to reject the whole chapter as "a worry based on her age". That's not the case. This is a really scary chapter which goes into a lot of detail on the mechanics of gaming addiction and the reasons why our children, with Asperger's syndrome or autism, are particularly at risk. There were many parts of this chapter which had me acknowledging not only my kids behaviours but those of their friends ... and indeed my own behaviour in my younger days. One thing is for sure, we'll be looking more closely at how gaming occurs in our family in the future. Chapter 7 is all about teaching vital life skills to your child before they become an adult. It covers chores, breaking steps down, using technology to better manage oneself, driver education, interactions with the police and even romantic entanglements. It's a very good chapter but to be honest, my mind was still reeling after chapter 6 and I'm not sure that I took it all in. There's a great example cited by a professor in chapter 7 where he talks about kids who attend college but have never had to use an alarm clock. Normally their mothers wake them, find their clothes, remind them to get dressed and to have their breakfast. This is great while they're at home but parents who do too much for their kids at home actually put them at a disadvantage. The loving push is what is really needed. 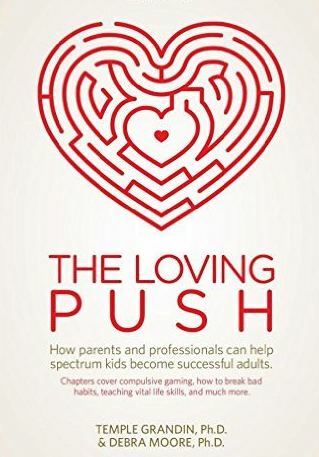 The loving push is hands down, the best autism book aimed at late teens (through to mid-twenties and sometimes beyond). If you have one of these kids already, this is the book to get.... particularly if they spend "too much time" on the computer and/or in their bedroom. If you don't have a teen yet but have a younger child, this book is still a great one to get. It will become increasingly valuable as your kids get older and the earlier the techniques in the book are applied, the better. I really can't praise this book enough. "There's a great example cited by a professor in chapter 7 where he talks about kids who attend college but have never had to use an alarm clock. Normally their mothers wake them, find their clothes, remind them to get dressed and to have their breakfast. This is great while they're at home but parents who do too much for their kids at home actually put them at a disadvantage. The loving push is what is really needed." I am really excited to hear about this book geared for young adults on the spectrum, When my son was 20 and in college I had him move to his own apartment. As a parent of an aspergers child it is always easier to do the activities of daily living for them. I knew enabling this would not be to his benefit. So in order to ensure that he can live on his own and be independent with me available to help him out when he would lose direction in navigating the day to day. Now Four years later , we began a writing project that explore our own perspectives on growing up on the spectrum. Take a look at the blog if you like, and we would be happy to submit a guest blog post if you like . Thank you for this review. I've been looking for a book exactly about this topic. There are hundreds of books for kids - but making that transition to young adult and then independence is not well covered (and often only bleak footnotes). I am looking forward to reading this. I have only just found your site and to be in Australia!. I will be purchasing this book thanks for the review it is so hard to find good books that don't repeat the same over and over and directed at the younger aged children. I have a 12yr old daughter with Aspergers whom I now home school as she struggles not being a genius as many around us seem to be. We are now learning using different methods than at school. She will always be way behind but we are learning!. Your site is so refreshing, I will be returning often to catch up dates. Thank you so very much for your blog and all of the resources! I've been gaining a lot of perspective in all of the comments and book reviews. I'm in a relationship with a man who is on the spectrum AND from a vastly different culture from my own. He had never heard of Aspergers before I mentioned it recently and luckily we are both interested in researching it more and finding ways to leverage the strengths and to manage the difficulties. We are both in our late twenties and he is having troubles transitioning to independence from his parents. We are both a little concerned that he is becoming dependent on me as a substitute and that his apathy, depression, and negative thought habits are going to be obstacles to building a life together. Do you think this book would be helpful for me? Do you think I should suggest it to him to read as well, or would that be somehow insensitive or provoke a negative reaction? Thank you again! That most of the time he sit in his car and never went to class. Ever since he was a young child we were called from the school to pick him up due to sickness, as soon as he got home he went to play computer games. Now days we disconnect the internet but perhaps is too late. He suffered from depression so he takes zolof and Wellbutrin. Now we are thinking that ritalin may help him with executive fuction that is missing. I certainly hate to give him meds.